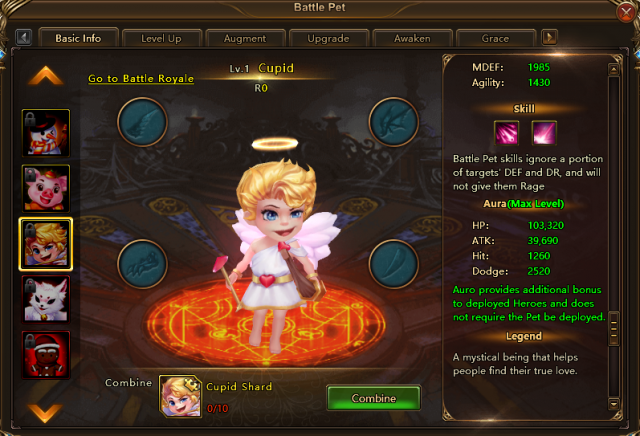 New battle pet Cupid comes to League of Angels II now. He aims to help those players who are still singular to find their true love and become powerful heroes. Cupid will show up in upcoming Single Server Resource Tycoon event from Mar. 28th to Mar. 31st. Seize the chance to get him! Deal ATK*(383%+14300) DMG to front row enemies and reduce healing effects on them by 40% for 2 turns (this effect ignores immunities). Deal ATK*(368%+13720) DMG to a vertical column of enemies and reduce their ATK by 20% for 1 turn (this effect ignores immunities). Take Cupid into your squad and it will show you how powerful it can be! Participate in the Single-Server Resource Tycoon from Mar. 28th to Mar. 31st. Accumulate specific Tycoon points and it will be yours! Stay tuned for more great news and events! Last：New Clothing Easter Bunny: Celebrate for Anniversary & Easter!